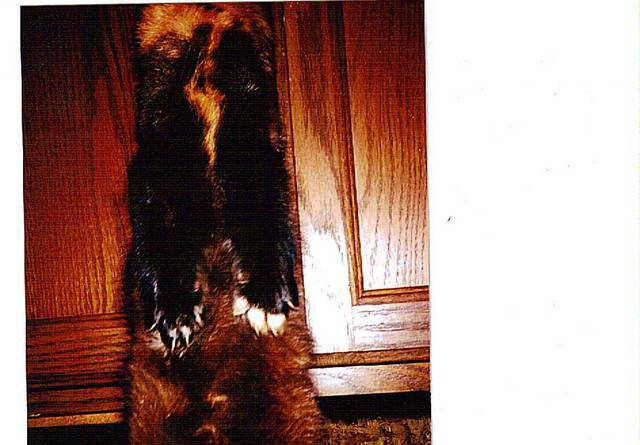 Yes squirrel is fur in, tail not pinned (on mine) YukonJeff is right the front legs stay inside the pelt. Rear legs can go on either side of the board or both, your choice. The graders want them on the front but its your choice. Check both auction houses websites, they change things quite often so it doesnt hurt to check. The grade won't reflect where the legs are pinned. I have done them with the back legs on both front and back, as well as down the sides. I like the look of having them pinned on the back, but there is hardly room with the tail pinned out. The fronts I just pull as I'm skinning, get maybe 3/4" from the body, and cut around the leg hide from the inside. This leaves a little stub that, when turned, goes inside. The one on the left was obviously going to auction. The one on the right went to a taxidermist for a full mount. Those front toes are a real pain for me and my tired eyes! The one on the right was an enormous male, the largest I have ever taken. Just barely fit on the board! That is a big one. I had one like that once. I had to stretch him on the ironing board. trapped4ever you are probably right about the grade as far as size goes, but the graders we had here said trappers who put the rear legs on the front would likely receive a better price overall. Mind you that was 5 years ago now and might have changed. There will not be any price difference no matter where you put the back legs. Personally I have always put the back legs on the belly side, however I switched to half on the back half on the front. Looks nicer but again there will not be a price difference. You can cut the back legs off at the last joint and the front at the elbow joint. Leave the front legs turned inside to prevent tearing damage in the drumming process. You should put the front legs spread over a stick or cardboard when leather out drying. This ensures drying under the legs and prevents rotting once the pelt is turned and the front legs are left inside. For me I take all of the leg fur and the top of the foot, Just my personal preference. Leave the saddle on, remove only fat and chunks of meat. It is important to split the tail to prevent rot and hair slip. You can pin it out, use screen, use cardboard or just pin down as white did. My preference is a screen or cardboard over the tail with a couple of pins to hold it in place. They do not grade the feet or the tail. Everyone has some personal preferences. All of the photos so far are acceptable methods. Thanks for the straight poop Ron. Ron when did they make the changes? We had two fur graders here, one from NAFA the other from Fur Harvesters. They put on a fur handling workshop because in their words they get to much fur that isnt put up to spec. They told us that you would see a price difference for tails not pinned or rear legs on the wrong side. That was a few years ago (5 I think) But I know my youngest two took the trappers course last year and thats how they still teach it. Ok dont want to beat a dead horse, but I also know poor or improper fur handling will cost a trapper a lot of money. I just called NAFA, and got lucky being it is Saturday. I talked to a fur grader who was there skinning. He said the proper way to put up fur is to pin tails out on everything, weasels, squirrels, marten, you name it. He said if you dont you WILL not get as much as if it were pinned. NAFA wants rear legs on marten on the same side as the tail. He went on to tell me that when your fur hits the grading table, you want the grader to go wow! He also told me how to gain an inch without thinning the fur. He said to use your thumbs on the belly side with your index finger on the back, then starting from the nose pull downwards, running your hand all the way down the pelt. He said there are five trappers in western Canada that routinely get 10 to 15% more at any given sale just because their fur is put up right. That works out to a lot of money. I highly recommend trappers get in touch with the auction houses every year or so. There is so much misinformation out there and they do change how they want pelts done from time to time. Anyway good luck this year, to all. According to the fellow I just talked to NAFA is expecting great things for marten this year. Only time will tell. Y254, I'm just telling you what my experience has been. I've put up fur all three ways over the years, sold to Seattle Fur exchange,Goldberg, Western Canadian Raw fur, NAFA, Fur Harvesters, cash buyers, private sales, and so forth. I send different bunches to different sales at different auctions, put up different ways. Kept track, and seen no difference in prices. Almost every grader I've talked to agrees. I've personally trapped, pelted and sold thousands of marten. The biggest change I can remember is in the early '80's, buyers decided claws on was a bad idea. I doubt if you will get less money with the legs tacked around the edge of the board verus all on the tail side. From the back side both look the same whereas from the belly side you see some skin if the legs are all on the tail side. Years ago a Western Canadian fur grader suggested I tack legs around the board edge. He said all he wants to see is fur when grading marten. If the impression is good it gets graded quickly versus a poor impression gets a good lookover. Last edited by bctomcat; 11/26/11 09:36 PM. trapped4ever understand your point completely. Everyone has their own preferred methods. I try to do it like the auction houses want, and every grader I have ever talked to has told me that good fur handling pays. They want the tails pinned open and the correct boards used. I know guys who are still using boards from the 80s. Those guys are not getting what they could from their furs. The fellow I talked to today told me the main reason they want tails pinned open was because if you dont there is a chance the tail could close up enough to spoil. Makes sense to me. A few years ago when weasels were averaging 6 bucks, my average was 13 bucks. Only thing I was doing different was pinning open the tails. Same with wolverine, every one I catch I skin for taxidermy. Yea it takes time but I average over 500 on them so to me its worth it. Bottom line is most trappers are going to continue to do things how they always have, but that doesnt mean its right or how the auction house would prefer. To be honest with you, conibear use, vs. foothold use, will get you more down graded fur, as long as they are put up the same. I do tack my tails out. Yes, obviously good fur handling pays. If you look above, you'll note Trapper ron, whom I believe was a NAFA fur grader, says, leg position does NOT affect price. I'll say it one more time leg position does not affect PRICE!!!!! 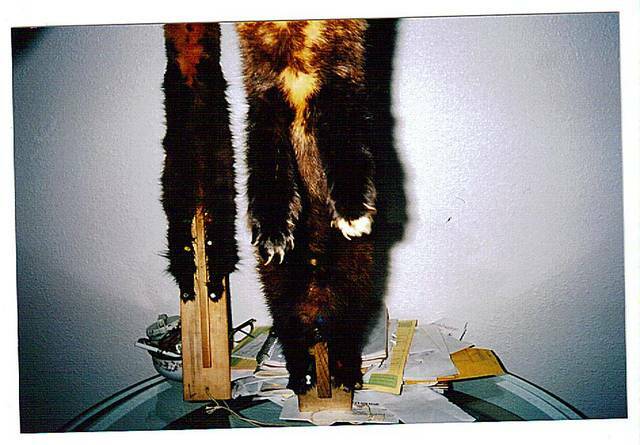 Bad fur handling, such as cuts, punctures, improper sized boards, tainted pelts, improperly fleshed, etc. WILL affect price. If legs aren't properly tacked out, it would affect price, but leg POSITION makes no difference. Last edited by trapped4ever; 11/26/11 09:11 PM. I agree especially with the new conibears, they are so powerful they certainly can and do damage the fur at times. Keeping them free of rust and freshly dyed helps.I certainly wont argue the point of leg or tail position, I only know what a fur grader who works for NAFA told me today. He disagrees with you and was very adamant about making the point that it will effect prices. I think its important to remember that I didnt just come up with this stuff, and Im not saying your methods dont work for you. I just relayed information I got, and it came from a guy who will likely be looking at your fur. Do with it whatever you like. Last edited by yukon254; 11/26/11 09:46 PM. Interesting Y254. I have no problem with recommending feet on the back, however there is no grade deductions or price for where the feet are pinned or how the tail is spread out. Graders do not have time when they are grading 60 thousand pelts nor is it necessary to grade the feet and tails. Tonight I called Ms Demers the sable (marten) grader for NAFA, she will be the one grading your marten. (she has more than 40 years experience grading at both FHA and NAFA) I read her my response and she concurred that everything I wrote was up to date. Yesterday morning prior to even seeing this thread I chatted with Dave Bewick the Vice President wild fur about most of these very questions. Mainly because I am writing another technical report for the NAFA web site on how feet and legs are handled on all species. Wanted to be sure I was up to date. Directly from Ms Demers. These are the main points of good fur handing when it comes to sable (marten). Feet: Rear can be cut off at the first joint and pinned belly side, on the edge, or on the back side. Front feet can be cut at the first joint or second and then split, not left tubular, to prevent rotting. Be sure to remove all claws. these can are sharp and a safety hazard to graders. They are of no benefit to the fur industry. Tails: First off and of primary importance is that the tail bone is removed and the tail is split. How you pin it out is not important, it dries as long as it is split and pinned in some fashion. Be sure that when you turn your pelt to fur out that it is straight on the board with no belly fur on the back. Try to use boards that conform or are close to those recommended. Trap fur when it is prime. Check your traps often and pelt asap to prevent taints. In my trappers education courses I show students my preferences or how I do it. At the same time I show them other acceptable methods. Good fur handling can take more than one form when it comes to feet and tails. At the end of the day it is size,color, and quality that counts in the grading of marten. Oh by the way Y254 that is a good point on getting extra length on your marten, I also do that. Last edited by trapper ron; 11/26/11 11:24 PM. Ron the fellow I talked to was Mel Stocking. I will certainly do a follow up on this as I am writing an article on fur handling and need good info. Mel was very adamant about pinning the tails. He said NAFA started asking trappers two years ago to pin open all tails. Mel also noted that when you pin the legs on the tail side it puts more fur on the back making it look fuller. Certainly no problem with promotion of those techniques, I back them up 100%. There has been for many years now steps to promote certain handling techniques recognized as being better or best. Unlike the ranch industry where you are dealing with many many times less people, trappers are too numerous to standardize pelt handling. The part I would disagree with is a down grade for not doing it, provided that the pelt was well handled. That is what we promote. Please PM with any question on fur handling or even ask here. Having both been a trapper/certified trapping instructor of more than 40 years, worked for NAFA (previous HBC / Dominion Soudack) for 10 years and consulted for many since I have a good understanding of standards in pelt handling, grading, and how the two relate to each other. Once I started working full time in the fur industry I had a much better insight into what I used to preach as gospel to what is acceptable to not loose in the grading process and to what is better. In pelt handling tutorials I would recommend showing more than one way where more than one way is acceptable. There seems to be some misinformation relative to lower grades when it comes to using the exact size fur board, how the animal is pelted, how feet and tails are handled. Certainly way off shape or improper cuts can be a form of downgrade when it comes to sizing or belly fur ends up on the back. Tails and feet are not among those except when it comes to taxi items like wolverine, wolves and bears. The number of lynx sold at auction for taxi purposes is miniscule. Thank you trapper ron. I figured you'd straighten it out, as to what is acceptable. I guess my stacks of Top Lot Certificates speak for me. Last edited by trapped4ever; 11/27/11 01:25 AM. Ron I think we all agree that these techniques are promoted by the auction houses, where we seem to disagree is on $ received. Are you saying for example that everything else being equal, size quality ect. 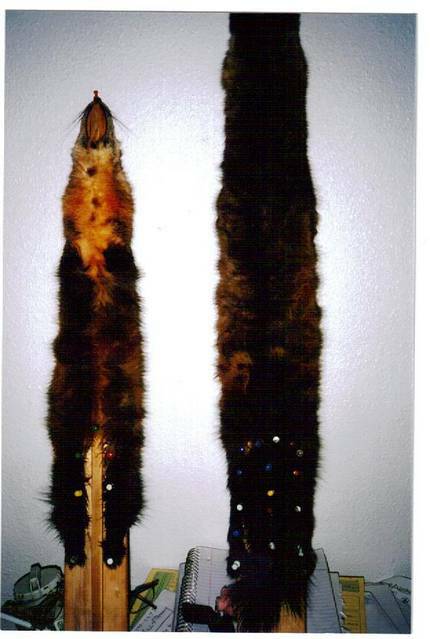 that two marten pelts, one with tail pinned and spread, rear legs on the tail side, the other just slit with one pin at the bottom, rear legs on the front,they will both bring the same price??? Thats my question. If your answer is yes then why on earth would anyone go to the trouble of doing it? That tail takes a long time. If that is what you are saying, then every grader I have talked with or fur handling workshop I have ever been to, strongly disagrees with you. Maybe when I used the word "grade" things got muddled? trapped4ever almost any prime fur is acceptable, that wasnt my point, my point was what do the auctions prefer, and does fur done the way they prefer bring more,than fur that is not, all else being equal. As for top lots, every trapper I know has them. Teddy Papas told me every year every trapper will catch an excellent marten or two, even in southern climes, these will go into the top lots. I dont mean any disrespect by that, Im sure yours are first class. I do know one thing I will be calling the auction houses Monday, and if I can get as much for un-pinned tails, I wont be doing it anymore. At 14 bucks a pop I can save a bundle on tail spreaders! As a fur seller I would feel cheated if I was down graded for having the feet on the belly side of the board,because when that fur comes back from the tannery they WILL be back on the belly side again. Presentation is nice but should not take anything away from a otherwise perfect fur. and thanks Ron I aprieciate your insight on these matters.